We're back in business here. It's amazing what a little threatening to switch to a different internet provider can do. Amazingly they were suddenly out here in less than 24 hours and we now again have Internet! Isn't it amazing how that works??? Some times, you just got to get a little nasty. So, I'll go ahead and apologize to anyone who is not family and those who do not care, but I promised my family that I would post pictures of our yard. Since this blog is mainly for them....they're request will be fulfilled. 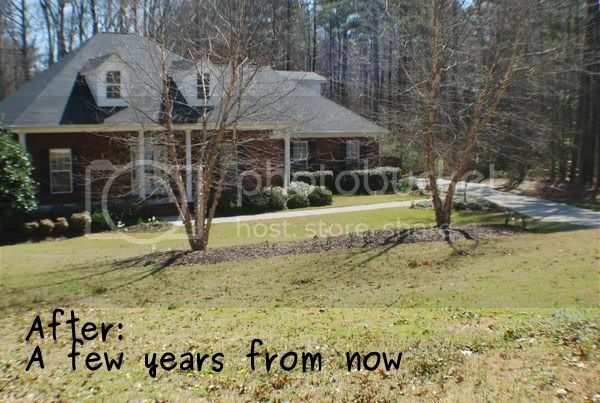 To explain (in case your new)....we bought our very first home last year and it was a fore-closer. A fore-closer that needed a good bit of work both inside and out. But, it was a great deal and we walked into our house with already $50,000 in equity, so it was something worth putting the work into. We've spent the first year working on the inside and the back yard (it needed the least amount of work). 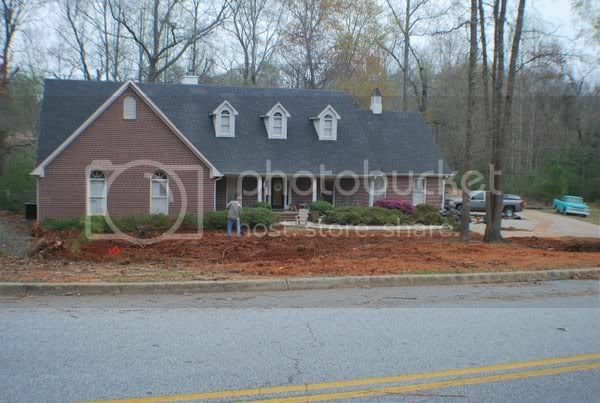 The front yard was a totally different story....it was bad....bad folks. In fact, it is probably safe to say it was a danger zone for anyone who walked through it. True story....last Halloween, a kid fell into a hole in our front yard. No lie....David yelled at her to not go that way, but in all her excitement of getting some candy, she did and feel knee deep in a hole..... can we say EMBARRASSING for us!!! Thankfully, she wasn't hurt and the parents didn't press charges. I can't promise she'll be back this Halloween for candy though. Originally, we figured it would be a few years before we could afford to touch it, but we've already gotten sick of looking at it. Plus, Olivia loves being outside and we 99% of the time end up out on the front porch. We had a couple of professionals look at it and we've gotten several different quotes for several different ways to improve it, but we just really couldn't afford it. Plus, we can always justify to ourselves that spending that kind of money would be better spent on something else. So, David decided to price out if we did it ALL ourselves and there was no going back after seeing how much we would save. Since he only gets a real weekend off every six weeks, we planned a few weeks back to go ahead and go for it. That way his dad would be here to help him. So two weekends ago, they spent the entire day cutting down somewhere between 9-12 good size trees. Why is there not an exact number??? David says 12...I only counted nine and that's even counting the one he didn't exactly cut down, but instead fell over after another tree he cut fell on top of it....but, whatever....who's counting? 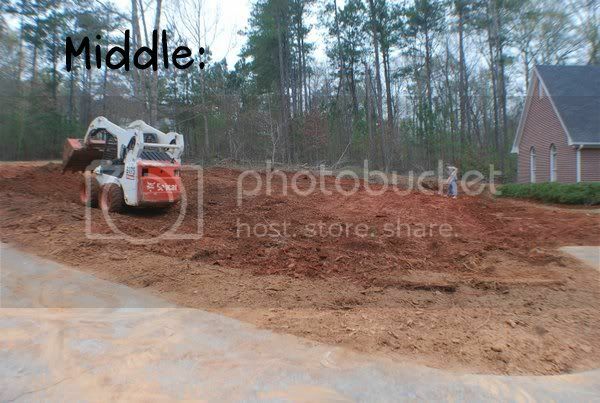 This past weekend, they rented a bobcat and got to work on grading the yard. We had a huge ditch that followed the side of the yard that was so deep, I could stand in it and you couldn't see me. 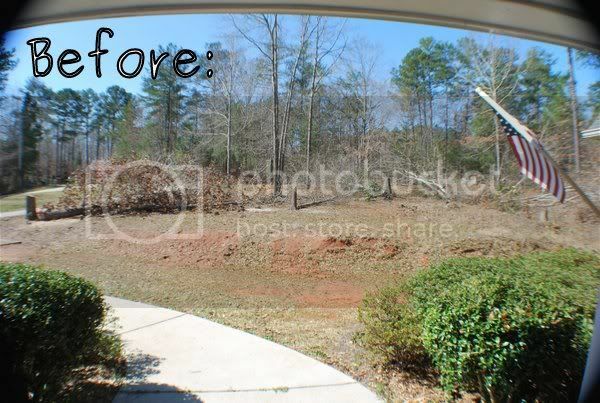 Plus, years of erosion (and nothing done about it) lead to a huge drop off in the middle of the yard. Like I said..danger zone! I do have before pictures, but they are stuck on the other computer, so I'm using a picture from the weekend they cut the trees down as a before shot. 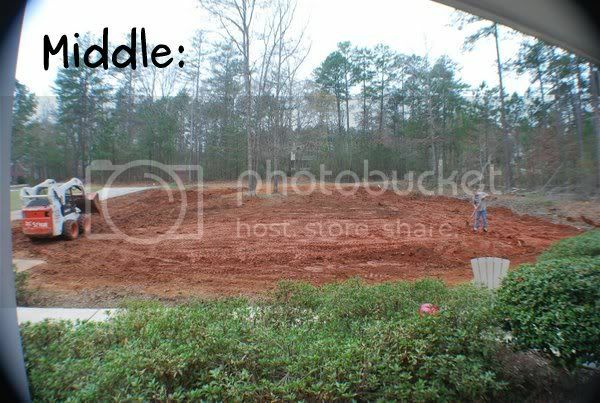 So, it's not a true shot of how bad the yard really was. That part of the yard that is under the flag, yeah...that was like a four foot drop off. The picture doesn't do it justice. We seriously had the neighbor from one house over come and introduce himself. He asked if we had just moved in....uh....we've been here over a year now. He must have not noticed the truck parked in front from the kabillion trees in front. Now we're ready to till it up and lay some seed down. Yes, we would love to be able to lay sod and have instant grass, but it's not in our budget whatsoever! So we're having to take the wait and see approach. If you've made it this far and aren't family or friends...pat yourself on the back! I know this is very anti-climatic to just see a yard full of clay, but I promise, to anyone who has been to our house before, it's a big difference!!! Here's hoping to no injuries this Halloween!!! Great job! I see John's chair sitting there. We have great pictures of you working also. You have done so much yourself. Send me a picture of the side part. Love you! I hate yard work and that seems like a huge undertaking! Kudos!